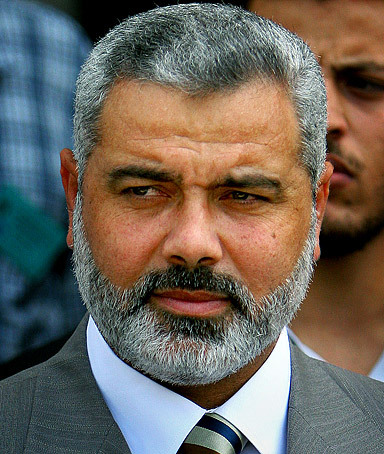 July 05, 2013 AFP Ismail Haniya, head of the Hamas government in Gaza, appealed in a Friday sermon to have faith in the Arab Spring despite the ouster of Egypt’s Islamist president Mohamed Morsi by the army. ‘Do not fear for the Palestinian cause or for the resistance (against Israel) or for Gaza. Egypt is behind us, as are the Arab and Islamic countries,’ Haniya said. Haniya’s political adviser Yussef Rizq on Thursday criticised on his Facebook page the ouster of Morsi, Egypt’s first democratically elected president. ‘What happened in Egypt, his eviction and removal of power, is not part of a genuine democratic process, because they used military force and not the voice of the people through elections,’ Rizq said. Hamas has not officially reacted to Morsi’s removal whose election it feted in June 2012 as he hails from the Islamist Muslim Brotherhood, to which the Palestinian Islamist movement is affiliated. Posts from May reported on the visit by Global Muslim Brotherhood leader Youssef Qaradawi to Gaza where he was greeted by Prime Minister Haniyeh and where Qaradawi took the occasion to call for “Death by Jihad” for Israel.